I think that one of the most frequent problems that we encounter when talking with customers is wavy quilt borders. They can be a pain in the you-know-what sometimes. I have helped newbies and experienced customers all stuck with the same problem---"What's wrong with my quilt?!" Usually it's an easy fix but might involve a session with the seam ripper. Sometimes we, the quilt creators, don't even realize that the borders need some help. But when we start to baste (pin or spray) or quilt the layers together, we encounter a mess as we work from the center of the quilt outward. At this point, there are few satisfactory solutions to making it right. You might be able to take a little tuck or dart in the outer border to eliminate some of the excess fabric. I've even talked with other longarm quilters that have worked in an extra strip of puffy batting under the border strips to solve the problem. I have even tried misting with water and then scrunching the fabric together to try to get it to shrink a bit when there is only a small area to fix. Or, if caught early, the borders can be removed and sewn back correctly. Almost always, the problem is too much fabric in the border, so there is always enough fabric to work with. But all of this worry and fuss can be eliminated if the borders are sewn on right to begin with! So, let's look at the wrong way to apply your borders. You cut the fabric strip the width that the instructions state, and you join strips end-to-end if needed to cover the length and/or width of your quilt top. Then you start on one edge with that long strip matched at the beginning of the seam, and you sew and sew and sew until you get to the other edge of the quilt top. Then you go over to your cutting area and make a straight cut to cut off the rest of the border strip, and you move on to the next area to be sewn. 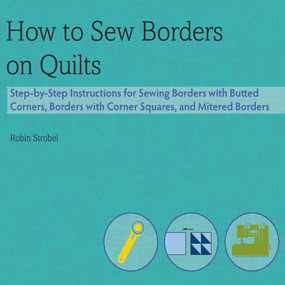 If this describes the way that you sew your borders, please read the very helpful resource below to learn how to do it the right way! Click on the this link -- How To Sew Borders On Quilts-- to get a good explanation of the right way to sew borders. And not just straight borders with butted corners, but other types, too. You will thank yourself that you took the time. I hope you find this helpful, and become a happy camper when you sew your next borders!